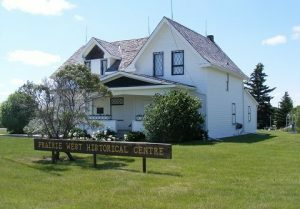 The Prairie West Historical Society is a museum and gallery located in a restored farm home formerly known as Evans House. The art gallery in the Evans House features artists with local connections, including a Picasso print. The museum also contains a one-room schoolhouse and homesteader’s shack. The museum is open for tours Monday to Friday from 1pm to 5pm from May to August. Visits can also be arranged by appointment. Admission is free. Find the museum on Facebook.